Because they live at high elevations, they can withstand lower temperatures that other snakes. Eats small rodents, birds, amphibians, lizards and other snakes, including venomous species. Mimics the Coral Snake in coloration which is a venomous cobra. 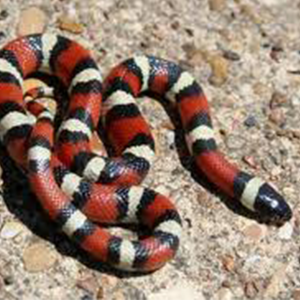 The Milksnake, however, is not venomous. Vibrates its tail to sound like a rattlesnake in order to scare away predators.